If you ask busy people in this fast-paced world what true luxury is to them – then the answer is rarely very original and generally does not include a new watch. True luxury is time. And that’s precisely what this is all about. At ochs und junior, we manufacture objects, generally watches, that bring joy. But what is the connection I see between “true luxury”, the joy of beautiful objects, and Dirk’s watch? Well, perhaps Dirk’s watch embodies precisely this desire for an object that brings joy. Instead of the displays that are usual on a watch nowadays – if it is a smartwatch, it might even dictate the tempo of one’s whole day – Dirk’s watch shows only the indications that have structured the days before industrialization: sunrise, the sun’s position, which shows the time of day, and sunset in the evening. This watch is Dirk’s very personal timepiece and a charming, sensible counterpart to a smartwatch. It may not create more time for its wearer – of course it doesn’t – but perhaps it symbolizes a more conscious dealing with time. Normally, making technical changes to Oechslin’s constructions is not a good idea. His innovations are coherent and based on 40 years of continuous development – work experience that is absolutely unique. So, Dirk’s idea to show only the astronomical functions of the watch and to forego the “additional information” of hands indicating the time as well as the date display had consequences. 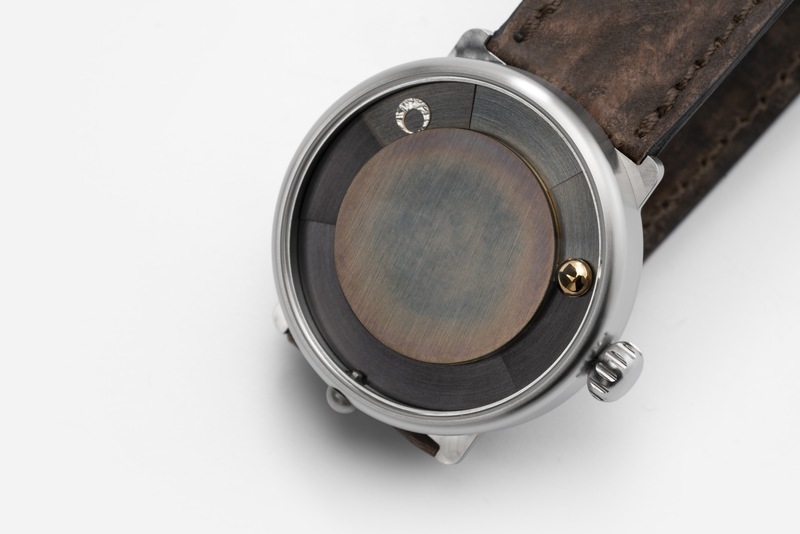 Since Oechslin powers his calendar and astronomical functions using the hour pinion, a new dial – of course, it’s more of a center disc than a dial in this case – had to be constructed. The hour pinion of the Ulysse Nardin UN-320 movement serves the functional parts 1 through 5 from the list of parts (link) – while parts 6 to 11 are powered by the date disc. Therefore, the height of the “dial” had to be raised to the level where normally the hands are. The hour pinion now reaches up to 0.25mm below the upper edge. And the date function lost its opening for the display. The dial is thus a new development. Like all parts of the day/night watch, it was manufactured individually by Helfenstein Mechanik AG in Alpnach, Switzerland. For the first time, we created a round, three-dimensional sun in 18K yellow gold for a day/night. The sun, as well as the moon in platinum PT950, was manufactured for us by Höllmüller GmbH in Lucerne, Switzerland. And then the patination: Dirk describes the whole process quite well, in his text below. In the new year, Kevin will write a blogpost to describe the art of patination in more detail. This day/night is another example of how far we can take Ludwig Oechslin’s designs for our clients. It is an example of the type of requests we can accommodate – and we are still learning! My initial “journey” with ochs and junior did start so many years ago, triggered by a publication on ThePurists. I remember the first posts from Magnus Bosse. I was immediately intrigued. But going back quite some time first. My watch journey has probably started like for a lot of people. My father was interested in watches, I even had an uncle in the family who was a hobby watch repairer. So I did get my first “real” watch when I was 12y old, a Tissot, got a Longines when I was 16y and so it went on. The next steps were again steps that a lot of people take: from Zenith, Girard Perregaux to Blancpain and finally to Lange & Soehne and Patek Philippe. But somehow, although all fantastic watches (never sold a watch in my life), it felt as I was missing something. I just wanted to go back to basics but with a twist. And that is where ochs and junior came in my life. After having moved to Switzerland, the contact was even easier. And how nice it was to interact with Beat and team. This resulted in acquiring a Moon Phase Light for my wife and I ordered a Perpetual Calendar, all in pure materials. I have never been touched more by a watch. Can’t describe exactly why. Is it the simplicity of the lay out? The materials used? The genius from Ludwig Oechlin? The personal touches you can give to your watch? Or all of that? But wait, a kinetic sculpture is not a watch. So when I saw the initial prototypes of the day/night, I was sitting on a table with Beat and I said: I don’t like the date, can you make it without date? The answer was yes. A couple of minutes later after staring at the watch, I asked: can you make it without hands? They are disturbing for me the essence of this watch. Beat looked at me started laughing and asked if I was serious. My answer was a simple yes, his answer also. One of the reasons of being able to make up my mind was the H8 of Beat (what is in a name) Haldimann. Going back to basics, hearing or seeing time go by without knowing the correct time is for me something extremely fascinating. So back to my new watch. On top of my previous point, everything related to astronomy always gets my attention. 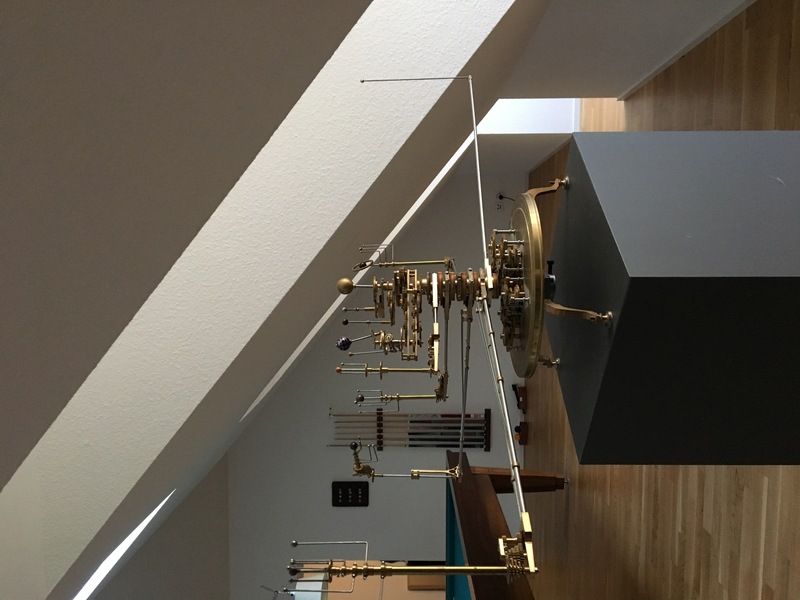 This resulted for instance in the commission of a nine planet orrery. So once the decision was taken to have no date or hands on the watch, Beat did send me some templates that I could use for designing the watch. My initial idea was to have an enamel dial. As the dial of the Sun Moon has also a function on the backside, this would not have been easy. Moreover, it might have taken ages to produce. Second option was to paint the dial, but I was not sure about this option either. 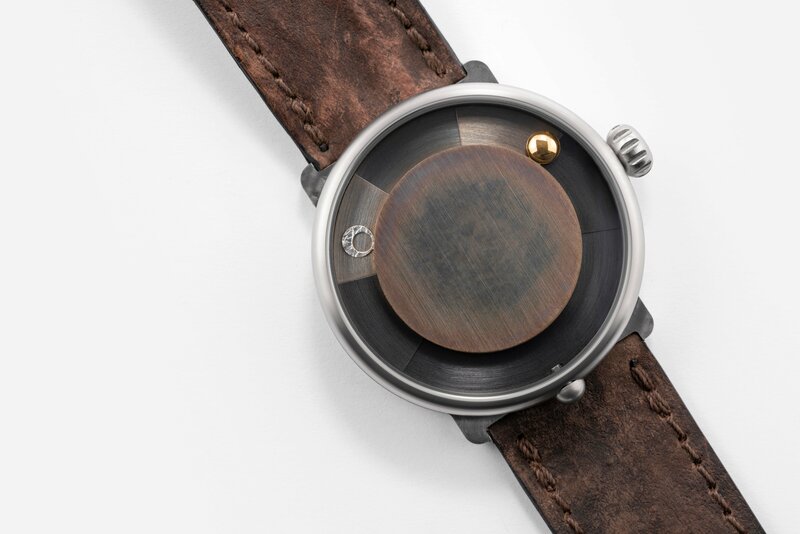 Then I came up with the idea to have a 3d printed metal dial. I did find a company in Sweden who could work at incredible small tolerances. So why not print a 3d map of Basel. I would have 2mm of height to play with. It would have been a very costly approach ($10k+) without knowing the real outcome. A bit too risky, even for me…. So, Beat and Kevin came back with the idea to start “small”. Why not just patinate the center dial. It always could be changed afterwards. While discussing that, I also came up with the idea of a more 3d effect for the sun. Again, Beat said it should be possible. So that started off the frequent interaction with Kevin. It was a joy to work with him over the months that it took to get the dial right. Patination is not an exact science, so I lost count of the number of test dials that were produced. I also change my mind a few times during the process. In the beginning I thought that having stars in the night sky would be fun, but after thinking, it did not make sense as the night part on this watch is below the horizon hence invisible to us. The same with the moon, initially I thought it would be cool to have Luminova on top of it but for the same reason as for the stars, it did not make sense either. Just to say that it was an interesting project with a result beyond all expectations. Now that I have the watch for a week, I start to get used to the fact that a quick glance to read the time does not do the trick. There is the fact of the length of the day, the real sun time and on top of that summer or winter time to consider. Still my feeling is that I could get it right to around 30 min, perhaps in the future even 15 min. Who needs more accuracy, certainly in weekends? 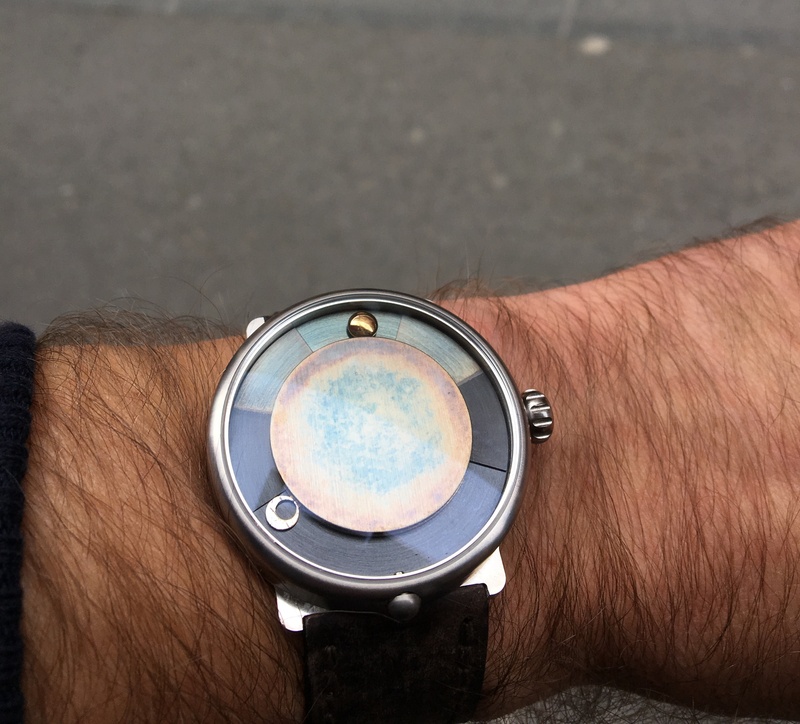 On top of the always fantastic studio pictures from Cail, I also wanted share the first snap of the watch seen through my eyes outside of the shop in Luzern. Thx Beat, Kevin and team!